Sprinkle crushed candy canes over cooled cake before serving for a “peppermint hot cocoa” twist. Store cake tightly covered at room temperature up to 2 days. To easily cut cake, use a knife sprayed with cooking spray. This hot chocolate cake is so good and so easy, you’ll want to make it all the time. 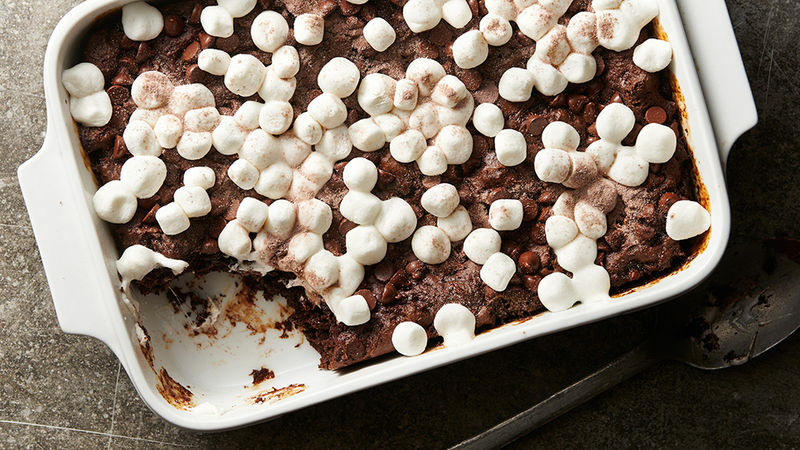 With its fudgy, cakey texture and gooey mini marshmallows, this decadent dessert will be a wintertime favorite. While this recipe calls for semi-sweet chocolate chips and hot chocolate powder sprinkled on top, you can try other ingredients to create all new types of chocolate cake. Add chopped up Andes™ mints for a cool minty flavor, or crushed candy canes for a holiday-style dessert. Or even top with chopped-up pieces of your favorite candy bars. There’s no wrong way to decorate this cake. And don’t forget to try all of our chocolate cake recipes. We’ve got everything from easy dump cakes to made-from-scratch delights. Whatever your style, you’ll be more than ready for baking season.